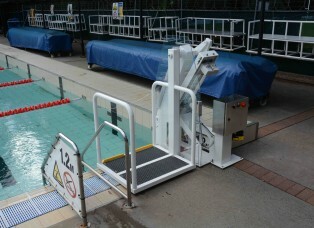 CMA manufacture in Australia a heavy duty lifting platform for swimming pools. 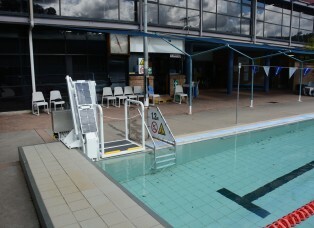 The platform provides dignified independent access for swimming pools for anyone that finds using a ladder inappropriate. The platform has been designed to lift a person in a wheel chair or a person with limited knee or hip flexibility. 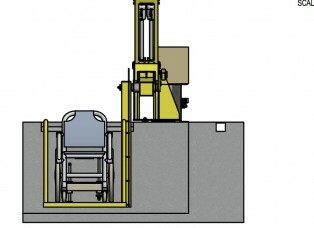 The lift has a capacity of 260kg allowing a helper to also go on the platform. The machine is manufactured from powder coated stainless steel. It is easily retrofitted to existing swimming pools and we provide the option of an installation service. There is an option of a Cat 4 intrinsically safe area scanner to provide protection from people touching the mechanism while it is being operated and yet also give an open feeling. Alternatively conventional guarding can be provided.